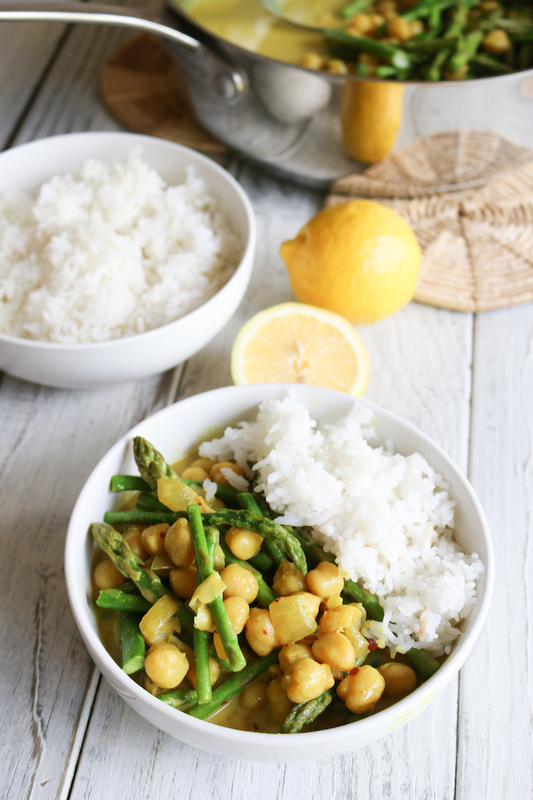 A vegan, gluten free, lemon infused coconut chickpea curry dish with sweet jasmine rice. Made in 30-minutes. Simple, healthy, fast and so delicious. In a large sauté pan heat the coconut oil over low heat. Add in the onions and garlic and sauté for 5 minutes. Add in the curry powder and crushed red pepper flakes and cook for an additional 1 - 2 minutes. This will help release the aromas in the spices. Add in the chopped parsley, coconut milk and chickpeas. Bring to a gentle simmer and cook for 10 minutes. Lastly, add in the lemon juice and asparagus and cook for 1 minute more or until the veggies are lightly wilted. Taste, season with salt and pepper and serve warm with a side of jasmine rice.